Departure in Koblenz / Coblence (left Rhine river side) 6:30 p.m. Boat round trip about 12 km from Koblenz / Coblence on the Rhine river along fortress Ehrenbreitstein, Deutsches Eck (German corner) and Mosel barrage to Winningen on the Mosel river, seat below deck, on board music and dance, big firework. Return in Koblenz / Coblence at about 11:15 p.m. Boat tickets together with cold / warm buffet per person 46 EUR. 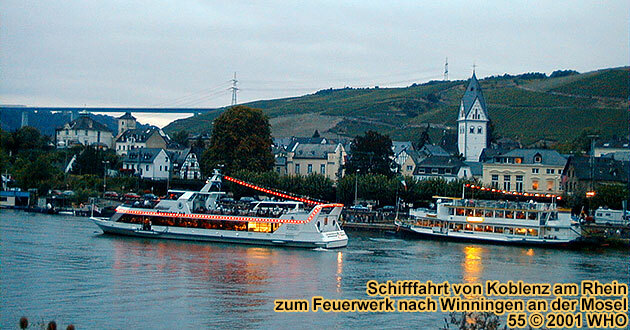 The Mosel / Moselle river festival in Winningen near Koblenz / Coblence is the biggest vine dresser festival on the below Mosel / Moselle river and has its fixed place in the Winningen event schedule since decades. With its long tradition, it's also known as the one of the oldest wine festivals in Germany. The ten-day folk festival starts on the last Friday in August and ends on Sunday in the following week. More than thousands of visitors from near and far are attracted to it yearly. The organizer is the tourism club of Winningen. As the absolute hightlight, one of the biggest fireworks on the Moselle river awaits the visitors on the last day with the event "The Moselle river in fire magic" ("Die Mosel in Feuerzauber"). The main show place of the Mosel / Moselle river festival is the wine yard court, where the so-called wine witch fountain is. On it you'll find a figure of the "wine witch". This Winningen figure goes back to a woman called Kathrin, who made justice to the wine and therefore received the name "wine witch" from her husband. Thus Winningen doesn't only have a wine queen, but also since over 70 years a wine witch. The festive coronation of the wine queen with its princesses and the proclamation of the wine witch belong to the glittering lights of the Mosel / Moselle river festival every year. At numerous wine booths and wine dresser alcoves and in the witch cellar the guests can enjoy the different kinds of wines of the Winningen vineyards "Weinhex" ("Wine witch"), "Domgarten" ("Cathedral garden"), "Bruckstuck" ("Bridge piece"), "Hamm", "Rottgen" and "Uhlen". Regional, ribald German food is offered here also. Eating and drinking is only done in traditional old tin dishes. An elaborate and varied program doesn't allow any boredom to get to the guests. The Winningen Mosel / Moselle river festival will be opened on Friday through the chairman of the tourism club of Winningen, the mayor, the wine queen and the wine witch. Entertainment and dance enjoyment is cared for on the individual days through different bands and wind ochestras. On several days laity actors and actresses play theater pieces. A lot of program points also take place on the weekdays - for example, a morning pint boat cruise on the Moselle river and a wine market in the August-Horch-Halle (a hall), where over 150 wines of all predicate grades and different tastes as well as vine dresser sparkling wines are offered. The coronation of the wine queen and the proclamation of the wine witch in the August-Horch-Halle (a hall) also take place in this week. The first Saturday is all in the token of the vine dresser parade. The festive parade with boys and girls in old tradtional costumes as well as the wine queen and wine witch is accompanied by the drummer and piper corps of Winningen. The crowning conclusion of the Moselle river festival on the second Sunday builds a giant firework under the motto "The Moselle river in fire magic" ("Die Mosel in Feuerzauber"). 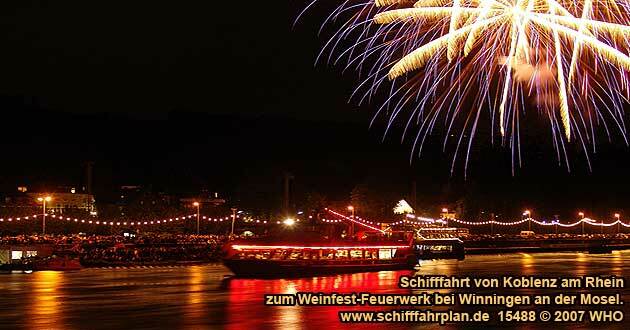 A firework display starts at 6:30 p.m. from the passenger boat from Koblenz / Coblence. The round boat cruise leads on a stretch from about 12 km past the mighty fortress Ehrenbreitstein over the Rhine river, the Deutsches Eck (German corner) in Koblenz / Coblence, where Moselle river and Rhine river meet, at the Moselle river barrier near the old town Koblenz, the districts Koblenz / Coblence- Metternich, Koblenz / Coblence-Moselweiss, Koblenz / Coblence-Guls and Koblenz / Coblence-Lay to Winningen. Music and dancing tune in to the splendid spectacle. After the fireworks, the boat parade cruise sets into movement again and arrives after a 12 km long return trip at about 11:15 p.m. back in Koblenz / Coblence. The firework display "The Moselle river in fire magic" ("Die Mosel im Feuerzauber") will become an unforgettable experience. A magical, beautiful atmosphere spreads out, when in front of the Mosel / Moselle river mountains, a wonderful scenery of pictures develop, which the exploding fireworks draw in the night sky and light up the Mosel / Moselle river gorge in such brightness, that a bengal illumination such as in the events of the "Rhine river in flames" / "Rhine river aflame" won't be missed. But the firework doesn't only offer something for the eyes, but also for the ears, because the already loud bangs of the firecrackers are even louder in the Mosl / Moselle river gorge. The firework display takes about 15 to 20 minutes. You can reach Winningen with the car, coming from Koblenz / Coblence, over the left side of the freeway B 416 which runs along the Mosel / Moselle river and coming from Cochem over the freeway B 49 and B 416. At arrival over the highway A 61 (Koln / Cologne-Ludwigshafen) you take the freeway exit Koblenz / Coblence- Metternich. With a train station on the stretch of Koblenz / Coblence-Trier, Winningen also has good train connections. Illegal reproductions of the pictures will be prosecuted. Without guarantee. Subject to change without notice. All rights reserved.